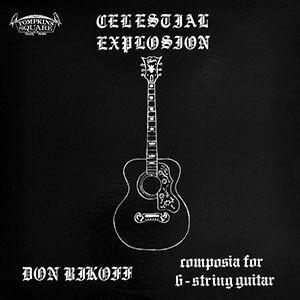 Don Bikoff released one lone, rare solo album, 'Celestial Explosion', on Keyboard Records in 1968, now reissued on LP/CD/DL by Tompkins Square. Watch the YouTube video of Bikoff playing on the Ted Mack Amateur Hour, taped May 12, 1968. You'll see the sheepish, long-haired, mustachioed musician spinning gold in a style (still?) so foreign to the mainstream listener. The befuddled host concludes after Don's performance, "That's unusual to say the least." A kid from Oyster Bay, LI, Bikoff got his start in Greenwich Village, annoying Dave Van Ronk and playing the folk/blues circuit where he met Sonny Terry & Brownie McGhee, Jesse Fuller and Mississippi John Hurt. The comparisons to John Fahey's and Robbie Basho's work stated in the LP liner notes touched a nerve with Fahey himself at the time. Today, those comparisons are still inevitable, however they are for lazy ears. Bikoff has his own approach. Don is only 65 years old, and he's still playing strong.